CD review: "Sweet Baby Blues"
This review first appeared in the August 26, 1985 issue of The Daily Aztec. Long an institution in San Diego, the Cheathams are starting to gain a regional following as well. Their first album as leaders, "Sweet Baby Blues," and recent appearances at top jazz festivals are garnering them a reputation they well deserve. Here in town, the Jeannie leads their weekly jam session every Sunday from her piano in the Mercedes Room at the Bahia Hotel on Mission Bay while Jimmy organizes the horn section and plays baritone trombone. "Sweet Baby Blues" contains three new songs written by the couple, and Jimmy arranged all the pieces. The arrangements and performances are impeccable with an inerrant sense of swing that hearkens back to the heyday of the Basie band. Drummer John "Ironman" Harris earns his nickname with every beat, saxophonists Curtis Peagler and Charles McPherson and trumpeter Snooky Young add in some great solos, but its Jeannie who holds center stage. Her voice is deep and throaty, well-suited to the blues, as is her forceful piano playing. Two of their best songs in performance are equally impressive on vinyl. 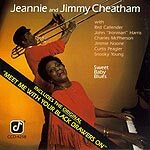 "Meet Me With Your Black Drawers On" is a raucous love song the couple wrote, and Jimmy's arrangements brings Jeannie's voice and piano to the fore, with the horn section executing well-paced exclamations for emphasis. "Cherry Red" is one of the most popular selections at their jam sessions, and the recorded version captures the same spirit of sensuality. This debut album from the veteran jazz artists is more polished than their weekly jam sessions, but contains all the spontaneity and exuberance of their live performances.